SAN FRANCISCO, Calif., Aug. 1, 2016 (SEND2PRESS NEWSWIRE) – – Geek Club Books, Inc., an autism nonprofit, and Someone Special Uniquely Personalized Books today announced their “Kindness and Awareness” initiative to help educate children about other children with special needs. Geek Club Books creates autism awareness education and curriculum so parents and teachers can introduce important topics of autism in the inclusive classroom. 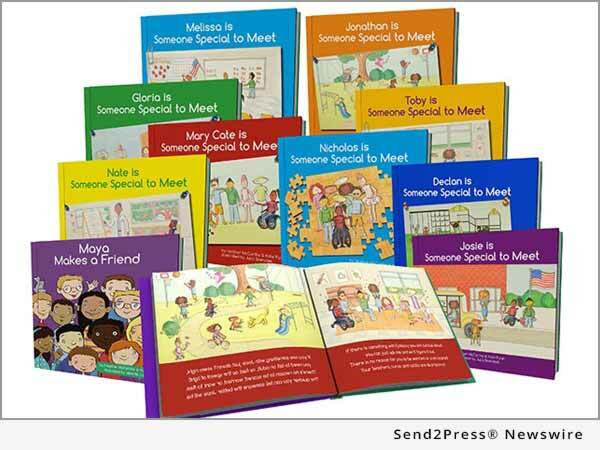 Someone Special Books allows the parent or educator to further personalize the message of acceptance through their customizable picture books. Working in collaboration, the two organizations help children develop the compassion and understanding for their peers with special needs. To kick off their initiative, Someone Special Books has chosen Geek Club Books as their charity of the month. During the month of August, they will give back 10 percent of their sales for Geek Club Books autism awareness education. To support Geek Club Books and Someone Special Books kindness and awareness mission, go to http://bit.ly/someone-special-books. Founded by Jodi Murphy in 2014, Geek Club Books is a 501(c)(3) autism charity with an autism education and empowerment mission. They produce interactive children’s story apps, enhanced e-books, curriculum, digital media and webisodes to change perceptions and end stigmas surrounding autism. The nonprofit partners with clinical advisors and educational specialists. A team of autistic adults collaborate and contribute their talents to everything the organization produces. http://geekclubbooks.com/. Someone Special Uniquely Personalized Books was created by Heather McCarthy and Kate Ryan to help children understand other children with special needs. Their mission is to spread the message of kindness and acceptance through personalized picture books. Each customized book focuses first on the child’s hobbies and interests and the second half focuses on the child’s disability, condition or syndrome. Children learn that children with special needs are more like them than they are different. http://someonespecialbooks.com/. *Photo Caption: Heather McCarthy (shown) and Kate Ryan of Someone Special Books partner with Geek Club Books for autism kindness and awareness initiative. News Source: Geek Club Books, Inc.
"We have a common mission and dream for our children," said Jodi Murphy, founder of Geek Club Books. "We want a kinder, more accepting world that looks deeper than a diagnosis." More from Geek Club Books, Inc.
Geek Club Books is a nonprofit with a creative autism education and empowerment mission. We ignite hearts and open minds through autism stories so all individuals with autism have every opportunity in this world to shine. Founded by Jodi Murphy in 2014, Geek Club Books is a 501(c)(3) autism charity that produces interactive children's story apps, enhanced e-books, curriculum, digital media and webisodes to change perceptions and end stigmas surrounding autism. RSS News Feed for Geek Club Books, Inc.